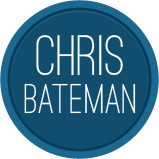 In 2012, I added 14 posts and 1 article to cbateman.com. The site hosted 2,200 visitors who logged 4,700 page views. The top countries were: USA (47%), UK (6%), India (4%), and Canada (4%). The top cities were: San Antonio (9%), London (2.2%), San Francisco (2%), and New York City (1.7%). 77% of visitors came from a desktop computer, 13% from a mobile device, and 10% from a tablet. The most-viewed page was Bouncing Along: CSS3 Animation, with 1,080 views. The busiest day of the year was November 12, when Nevermind Skeuomorphism, Just Get the Volume Display Out of My Face received 389 views. Visitor engagement was pretty low, but props go to my top commenters, Ian Smith and Tom DeForest, who tied for first with two comments each. Thanks also to Kevin Lamping and Grant Zabriskie for their comments. famo.us linked to Head-Coupled 3D Transforms in their slides from HTML5 Dev Conf. Addy Osmani linked to my Chrome Dev Tools theme in a post containing a collection of themes.